In 2014 and 2015, Reynolds invested about $3,200 in new technology and software, which will reduce over 1,000 pages of carbon copy paper and 5,000 pages of printer paper each year. 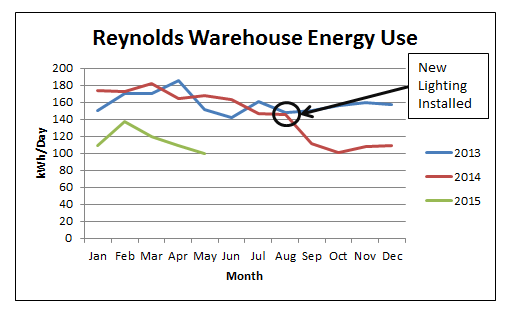 In addition to the paper savings, the process changes allowed Reynolds to discontinue using five printers, further reducing the electricity load. Reynolds invested over $18,000 in lighting upgrades at four facilities, reducing annual electricity use by 38,000 kWh and eliminating the emission of roughly 80 tons of CO2 emissions each year.